Presented in conjunction with the museum’s special exhibition “James Drake: Anatomy of Drawing and Space (Brain Trash).” Much as Drake’s drawings incorporate disparate ideas (drawings of cattle next to drawings of MRI scans next to angels next to barcodes next to self-portraits next to Mickey Mouse! ), this Big Sing incorporates a variety of songs with diverse subject matter and influence. Songs will range from cowboy tunes reminiscent of West Texas, where James Drake grew up, to Classical works and will span styles and time periods: “Oh What a Beautiful Morning,” “Shenandoah,” “Ode to Joy” (“Joyful Joyful We Adore Thee”), the Beatles, and more! Our first Big Sing of the season is the second half of a choral double feature! Kicking off at 5:30pm, Texas Choral Consort will present arrangements from Beck Hanson’s sheet music album “Song Reader” in a unique collaboration with the award-winning vocal ensemble Convergence and indie power pop outfit, The Normans. Come for both to get the best seats! Admission to the Blanton Museum is free that evening. 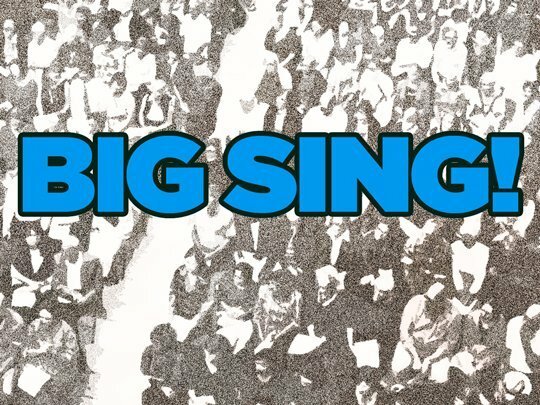 The Big Sing is only one hour long, but the galleries will be open until 9pm. The Blanton Café offers a special Happy Hour, with a glass of wine and a slice of gourmet pizza for $5, while the Museum Shop keeps its doors open late as well.